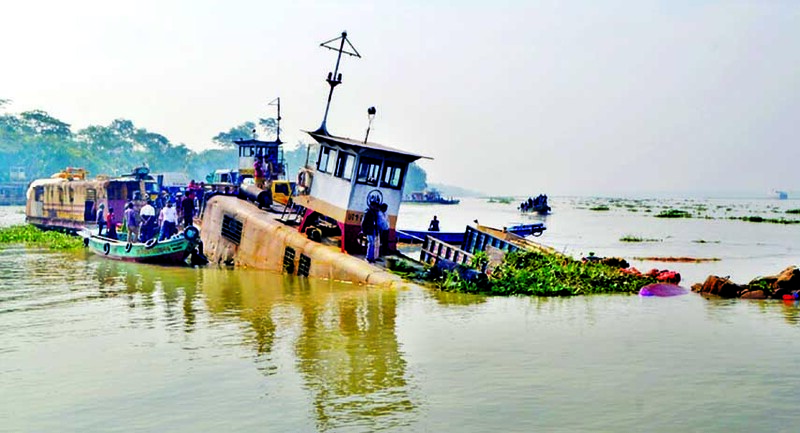 Print News | A bus and two goods laden trucks sank into Kocha River after a lighter barge rammed into a ferry in Pirojpur\'s Bakulia Port at 1.00 am on Wednesday. This photo was taken from Kumirghata ghat. A bus and two goods laden trucks sank into Kocha River after a lighter barge rammed into a ferry in Pirojpur's Bakulia Port at 1.00 am on Wednesday. This photo was taken from Kumirghata ghat.